Great quality Make up Brushes are vital when it comes to applying make up. It’s the difference between shedding hairs on your models faces or scratchy harshness from cheap bad quality brushes. I have a vast array of brushes in my kit from Mac Cosmetics, Smashbox and Shu Eumura and have just had the opportunity to try these beauties from Sam Chapman’s Real Techniques range which are available on line or in Boots stores. The softness, bristle quality and durability is so great even after constant washing and cleaning they still look brand new. 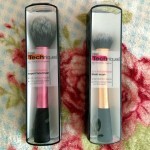 Clients have mentioned how lovely the brushes feel against their skin and I’ve had emails asking about them.